Steiner Rifle scopes are crafted to deliver in the crucial moments and ensure nothing escapes you when you take the shot. They help define the fine line between success and failure, and highlight the importance of having the right device for getting the work done. The German-engineered riflescopes are based on latest German optics and Laser & Lights technology, and fitted with world-class lenses and coatings to bring on board outstanding gun-mounted optics for global law enforcement and military personnel throughout the world. While the military series is manufactured to perform in situations when your mission’s success or life entirely depends on it, the tactical series is designed for challenging target sport shooting and tough professional situations. The hunting series helps in getting the trophy of a lifetime no matter what the hunting condition is. 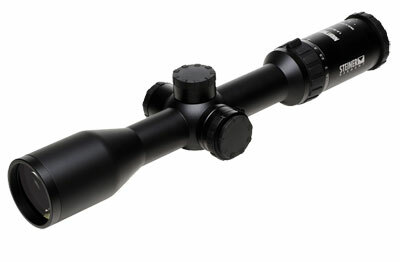 The total lineup of Steiner scopes is divided into Military Riflescopes, Predator Riflescopes, Nighthunter Xtreme, Steiner GS3 Riflescopes, Steiner T5XI Riflescopes and Steiner P4Xi Riflescopes, with a unique choice of reticles to satiate various applications. Steiner Military Riflescopes match military grade specifications, and help in probing, planing and attacking with force-multiplying stealth, surprise and impact. Steiner Predator Riflescopes have CAT (Color Adjusted Transmission) technology, ﬁnest German optics and high light transmission levels. Steiner Nighthunter Xtreme Riflescopes, originally made for formidable European night hunting scenarios, can be used for all lighting conditions and types of games. Steiner T5Xi Series, with SCR (Special Competition Reticle) reticle, brings clarity, accuracy and self-assurance to situations ranging from combat to competition. Steiner P4Xi Riflescope, the tactical optic with a compact design, is a suitable choice for pairing up with patrol rifles and AR platforms.